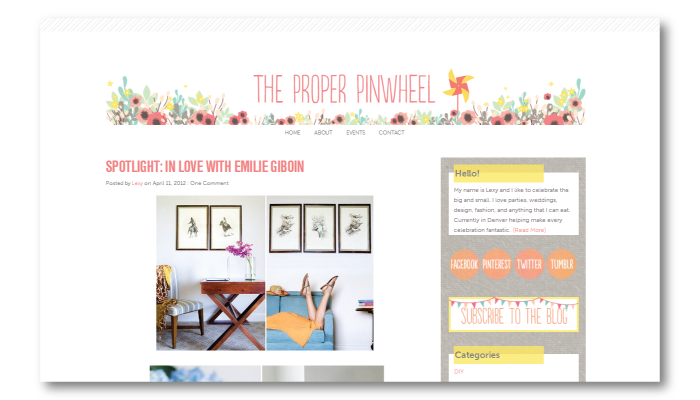 It's time again to say hello to one of our awesome SPONSORS, THE PROPER PINWHEEL. THE PROPER PINWHEEL is a lifestyle and design blog about parties, design, weddings, bits of yumminess and everything in between. Lexy is a party gal like myself, who has some beautiful DIYs in her portfolio. Remember this mug DIY? Yep, Lexy is the brilliance behind it. Her picks for Fresh Find Fridays? Always a must see. Am I the only one that loves those roundups everyone does on Fridays? I bet not. Go check out her blog and great pinterest picks. BTW, if you are in Denver, she can help plan your party. Makes me wish I lived closer...I know we could do one heck of a crafternoon together.